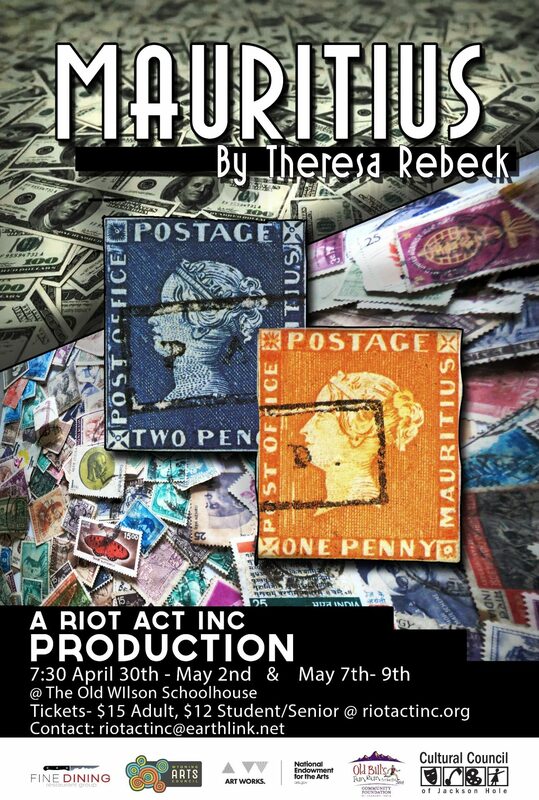 Mauritius by Theresa Rebeck – Riot Act, Inc. 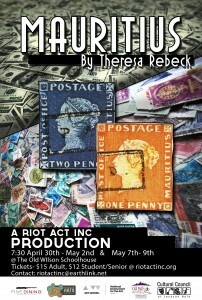 When: Show runs Thursday, April. 30-Saturday, May 2 and Thursday, May 7-Saturday, May 9, 2015. Curtain at 7:30 p.m., doors at 7:00 p.m.
Mauritius by Theresa Rebeck, crashes onto Jackson’s stage in April 30-May 2 and May 7-9, 2015. As two half-sisters deal with the aftermath of their mother’s death, they rediscover their grandfather’s book of rare stamps. One wants to sell for a windfall and the other wants to save the book for sentimental reasons. Enter 3 sleazy collectors who try to snake the book from the sisters. Filled with twists and turns of deceit, this drama will be sure to please. Directed by Macey Mott and first time assistant director Heather Best, Mauritius boasts a wonderful cast including Lacey Lukas as Jackie, Heather Goetz as Mary, Graham Koten as Phil, Zachary Singer as Dennis, and Brian VanHattan as Sterling. Snacks and beverages, Riot Act, Inc. T-shirts and Run of Show Raffle tickets will be available at the concession stand before each performance and during intermission. Raffle tickets cost $5 for one or $20 for five. Keep in mind, the show contains mature content including adult situations, swearing, and violence, so parental guidance is suggested and audience members age 17 or younger need to be accompanied by an adult or have a signed note from a parent. *Project made possible by grants from Wyoming Arts Council/NEA, Cultural Council of JH, Community Foundation of JH, Fine Dining non-profit of the week contributions and Your Old Bill’s donations.